At the end of Easton Street, located on the Coast Guard base marking the entrance to Nantucket Harbor. 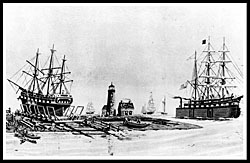 With the increasing whaling industry and whaling fleet on the island itself, Brant Point Light was built in 1746 to guide vessels into and around the inner harbor. Brant Point Lighthouse claims several distinctions: it is the site of the second oldest lighthouse built in America (1746), after Boston Light (1716) and it is also the lowest light in New England at merely 26 feet above sea level. It has the distinction of being the most often rebuilt, nine times rebuilt, starting with the light being destroyed by fires and storms and replaced five times from 1758 to 1788. These lights were primarily lanterns on platforms that were somewhat effective. 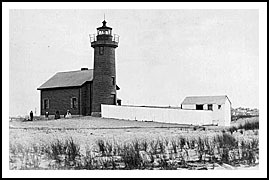 The present Brant Point Light was built about 600 feet from its predecessor in 1901. In 1983, the entire Brant Point Station complex was renovated by the Coast Guard, and in 2000, another overhaul of the lighthouse was completed. Nantucket offers miles of town maintained bike paths, pristine beaches, historic Victorian homes, and beautiful harbors for visitors to enjoy.It is an extremely quiet area and doesn’t even have a stop sign on the island, and visitors can use the Nantucket Transit Authority (The WAVE) to get around. 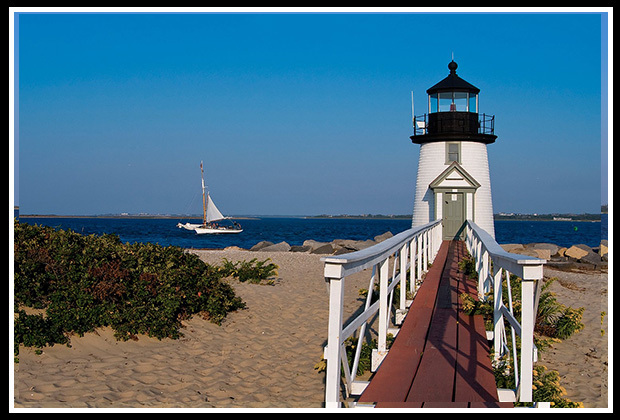 All three lighthouses on Nantucket are accessible by land. There are various festivals and special events to enjoy, including at the end of April, where there are over 3 million daffodils blooming across the area. The island offers miles of town maintained bike paths, beaches, historic Victorian homes, and beautiful harbors for visitors to enjoy. There are plenty of windswept beaches for families and thrill seekers to enjoy. Those with families tend to gravitate towards the gentle surf of the north shore beaches, like Brant Point with the iconic Brant Point Lighthouse, or Jetties Beach, which is a family beach accessible by an easy bike ride, or the NRTA shuttle bus. Many of these beaches are easy walks from downtown Nantucket. The grounds and beach around Brant Point lighthouse are open year round. The sandy beach area provides a quiet place to relax and enjoy views of Nantucket Harbor. The Maria Mitchell Association operates two observatories, a natural science museum, an aquarium, and preserves the historic birthplace of Maria Mitchell. It provides educational programs and exhibits for visitors. The Nantucket Whaling Museum coordinated by the Nantucket Historical Association, contains a major collection of all artifacts involving the whaling industry in the 19th century. The lighthouse grounds are open year round, and the lighthouse is located a short distance from the ferry dock at the end of Easton Street, marking the entrance to Nantucket Harbor. Specialty shops and restaurants are only a few hundred feet away from the lighthouse. 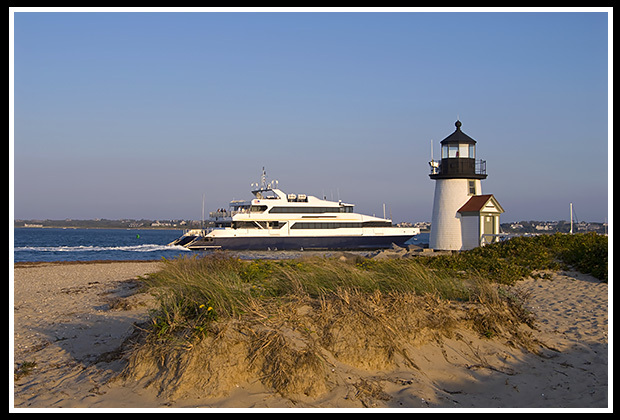 Both the Steamship Authority and Hy-Line Cruises offer ferry service to Nantucket from Hyannis. From the harbor you can rent bikes, cars, and mopeds if needed to explore the island. From the Steamboat Wharf, proceed up Broad Street and then turn right onto S. Beach Street. After just a couple of blocks, turn right onto Easton Street. The lighthouse is located just beyond the end of the street, but you will want to park beforehand in the spaces at the intersection of Easton and Hulbert Avenue. The lighthouse is an easy walk to enjoy views of the harbor. Most of the cruises mentioned below involve ferry service to take visitors to the islands from either the main land or between the islands. Boat cruises and ferries mentioned below may offer many types of cruises. Contact info is provided to help you plan your special trips to New England’s shorelines. Enjoy! My new book, Lighthouses and Coastal Attractions of Southern New England: Connecticut, Rhode Island, and Massachusetts, provides lots of special human interest stories from each of the 92 lighthouses, along with plenty of additional indoor and outdoor coastal attractions and tours in the area, with contact info to plan your trips. I'll be happy to sign it for you here, or you'll find it in any fine bookstore.